On Nov. 6, over 4.3 million people in Michigan voted in the midterm elections, 1 million more than last midterm, marking the highest midterm voter turnout in the state in 50 years. Leading up to the midterms, the nation underwent a massive campaign to get eligible voters registered and out to the polls to vote. While both parties were among those fervently calling upon the public to make their voices heard this November, the Democrats pushed hard championing their alleged “blue wave.” While Democrats were able to make sweeping gains across the country, Republicans were still able to put up a sizable resistance to the Democrats, blocking them in major races across the nation. 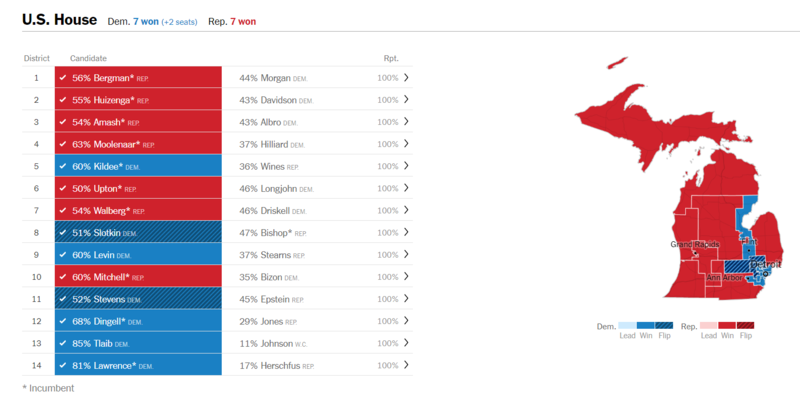 Following the elections many positions in the state of Michigan flipped to Democratic control. Democrat Gretchen Whitmer has been elected as Michigan’s new Governor, while Jocelyn Benson secured the office of Secretary of State and Dana Nessel won the Attorney General’s office. In the Senate, Democratic senator Debbie Stabenow was re-elected to her Senate seat, while in the House, Democrats were able to flip 2 previously Republican held seats, resulting in both parties splitting control of Michigan’s 14 House seats, with 7 being afforded to each party. Michigan is moving closer to becoming a “blue” state. Democrats received over 2 million votes in the State House, State Senate, and US House races, each. 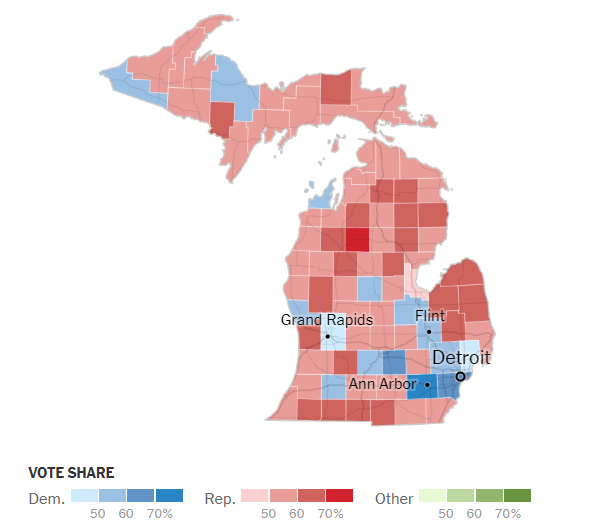 This strong Democratic showing in Michigan was not an isolated incident. Democrats were also able to flip 7 governor positions. Across the country, Democrats were able to take control of 32 House seats. Democrats have now gained control of the United States House of Representatives, breaking Republican control over all 3 branches of government. As reported by CNN’s Clare Foran, Democratic House leader and former speaker, Nancy Pelosi said in a letter to Democratic colleagues following the elections, “In the next few weeks, we need to be unified, find common ground with Republicans in our legislative engagements, but stand our ground when we must.” Pelosi hopes to regain her former position as speaker in January, when the newly assembled House votes. Despite that, many in her own party stand opposed to the former speaker, and have been planning to put forward a, yet to be announced, new candidate for speaker. Despite the Democratic victory in the House, Republicans were able to solidify control over the Senate for the next two years. Democrats lost a hotly contested Senate seat to Republicans in North Dakota. In Michigan all three ballot proposals were passed in overwhelming numbers. With proposal 1 passing, Michigan will now join the ranks of nine other states that have legalized recreational marijuana for those over the age of 21. Proposal 2 has now removed the state legislature’s ability to redistrict and gerrymander the state, and has placed the power of redistricting into the hands of an independent committee, ensuring nonpartisan and representational voting districts. And lastly, with proposal 3 passing, voters will now have access to same day registration, straight ticket voting, and no-excuse absentee ballots. Henry Ford College was able to benefit from this year’s election as well. Dearborn voters passed the Henry Ford College millage renewal by a margin of 40 percent. The one-mill tax was approved by Dearborn taxpayers in 2013 and now will be extended until 2024. The millage represents about 5 percent of the College’ s operating budget. Former board member Roxanne McDonald and trustee Jim Thorpe were elected to fill two open seats on the Board of Trustees, which serves as the board of education for both Dearborn Public Schools and Henry Ford College. Current trustee Mary Lane, who ran unopposed, was elected to a partial term. Even though the voting is over, and the election cycle in Michigan is finished, loose ends have yet to be resolved in other states. Missouri will have a runoff election for governor in late November due to no candidates receiving 50 percent of the vote. In Arizona recounts are underway for the state’s senate race and in Georgia, election results are being recounted for the governorship, while Florida’s Senate and gubernatorial races are currently undergoing recounts due to extremely close results. The action is still not over, and changes may still come.